The garden under a blanket of sow. 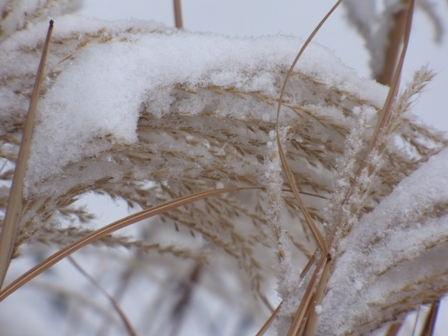 Maiden Grass covered in snow. 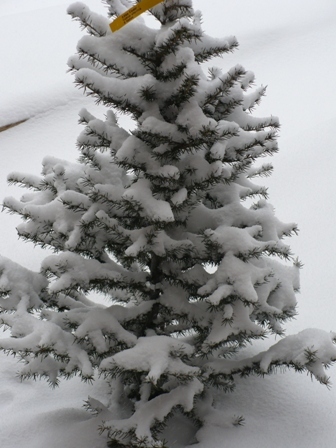 Christmas Tree? Nope, a small Atlas cedar. 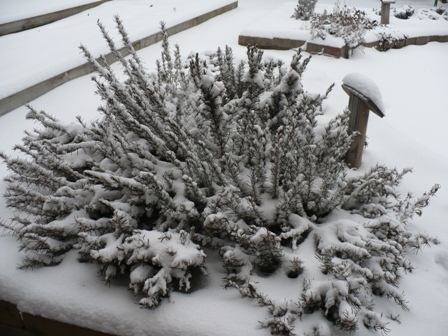 The rosemary is definitely not buried under the snow yet! Now, if only I can convince someone to come out and play in the snow with me! …And dream longingly of all the gorgeous salad greens that could be growing in it and ending up on my plate. 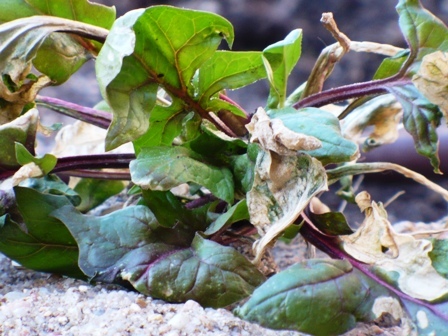 All the same, the fact that this spinach plant is still alive after surviving 0 degrees a few weeks ago with no protection whatsoever, is quite impressive. It made me sad to think that if only I had a nice, simple cold frame made from an old window, I could be having scrumptious salad greens from the garden right now, rather than eating boxed and bagged greens from the grocery store. My mind’s eye pictures lettuce and spinach, vibrantly green and toasty on those sunny, moderately warm winter days. On days like today, they would be tucked cozily into the cold frame, with a nice, insulating blanket of snow keeping them warm. 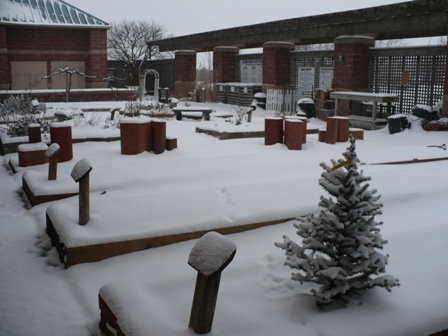 Update: This blog post is being entered in the January 2010 Grow Your Own blogging round-up! If you are interested in entering too, here’s the rules: http://www.andreasrecipes.com/gyo/ The host this month is House of Annie. You can visit this link for the current entry information. And HERE is the link to the Grow Your Own roundup. There are lots of great gardeners and cooks out there, so visit to get hungry! 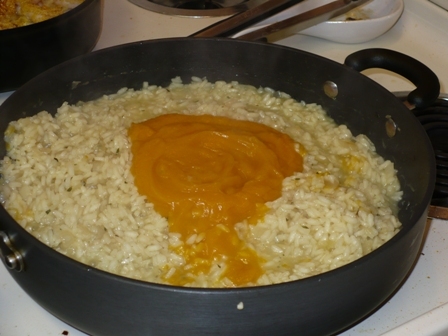 The butternut squash puree goes into the risotto rice when it is nearly done cooking. Ooh! Look what I found in the Demo Garden! I know you can’t tell what it is, but that, my dear readers, is thyme. Thyme is very winter hardy and can easily be harvested (lightly) all winter. Into the risotto with you! Time for dinner! 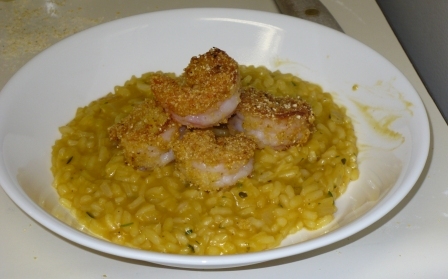 The shrimp was breaded in cornmeal and lightly fried in a pan. We did alter the recipe a little bit, depending on what we had on hand and what we liked. 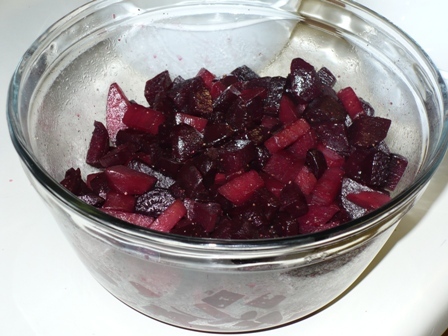 The beets after thawing, roasting with a little oil, salt, and pepper, then marinating in vinegar. 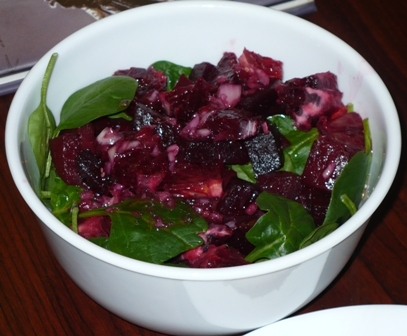 The beets and blood oranges on a bed of spinach greens. 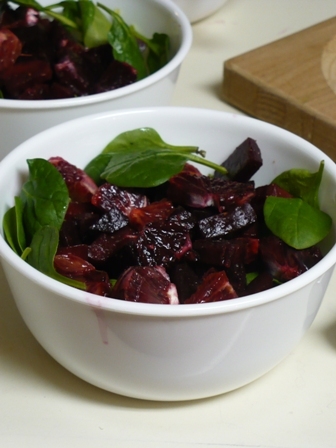 Yes, it would look better if we had used gold beets (good luck finding those in Wichita!) 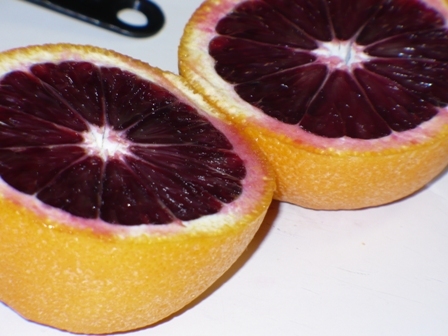 or normal oranges (but then I wouldn’t have found this recipe!). Oh well. The salad dressed with the vinaigrette – made from fresh squeezed blood orange juice, shallots, etc. Yum! If that doesn’t get you motivated to grow more veggies this year, I don’t know what will! Locally grown vegetables are fresh, delicious, and can boost the local economy. The first annual Central Kansas Vegetable Growers Workshop, sponsored by Sedgwick, Butler, Harvey, and Reno County Extension, will give beginning and experienced vegetable growers new skills to improve their production methods and marketing skills for selling their local vegetables, while meeting an increasing demand for locally grown produce. The keynote speaker, Patrice Gros, is a full-time organic vegetable farmer from Arkansas. The workshop will cover the basics of vegetable production including: building soil fertility, starting transplants from seed, season extension, crop planning, insect control, and marketing. The workshop will be held February 6, 2010 from 8:45 a.m. to 4:30 p.m. in 4-H Hall at the Sedgwick County Extension Education Center at 21st and Ridge in Wichita. Cost of registration is $10 before January 29, 2010 and $15 after. For more information, please call the Sedgwick County Extension office at 316-660-0100. Here’s the flyer/registration form for the workshop: Ctrl KS Veg Growers Workshop (pdf). Wow! I didn’t realize that we haven’t had a new catalog review since mid-December. Christmas and New Year’s sure tend to take a chunk out of the end/beginning of the year. To get back in the swing of things, let’s take a look at the 2010 Richters Herb Catalogue. Richters is a Canadian company, but we won’t hold that against them. They are (from what I can tell) the most complete mail-order catalog source for herbs. You name it, they pretty much have it. That being said, I’m going to have a hard time limiting myself to only “new” products with all the intriguing things they have in their catalog. 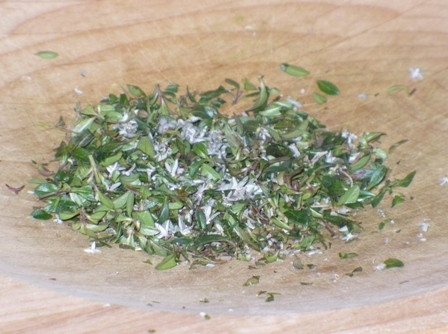 African Spice Basil – New this year, they found this basil growing in coastal West Africa. The catalog reads “a blend of spices and florals, with a hint of citrus.” Seems like something to try out if you are a basil lover! Leisure Cilantro – Heat tolerant, bolt resistant, high yielding…we can always use another good summer cilantro variety to try out! Green Sleeves Dill – Normally I would have skipped this, but since it is the Herb of the Year this year, I thought I’d toss this one out there. Again, very resistant to bolting (flowering). Lemon Sculpture Scented Geranium – A very upright geranium with leaves that stick straight out. Very bizarre appearance, but could be fun in a pot. Citrus Marigolds – A gorgeous, tiny, edible flower that lacks any of the annoying pungency of regular marigolds. They have the full array of yellow, orange, and red flowers. Citrus flavor is good for making sauces. Mints – They have pretty much every possible flavor of mint imaginable, and then some. Banana mint, anyone? Lemon Savory – Savory itself isn’t a very common herb in the U.S., and this lemon savory is something else all together. It is a bit finicky though! Okay, that’s enough of the individual listings. In addition to selling seeds and/or plants of tons of different herbs, you can also buy dried herbs from them. They also have a whole range of medicinal herbs, which I am less interested in, but some of you might like.